Download a blank fillable Dd Form 2967 - Domestic Abuse Victim Reporting Option Statement in PDF format just by clicking the "DOWNLOAD PDF" button. 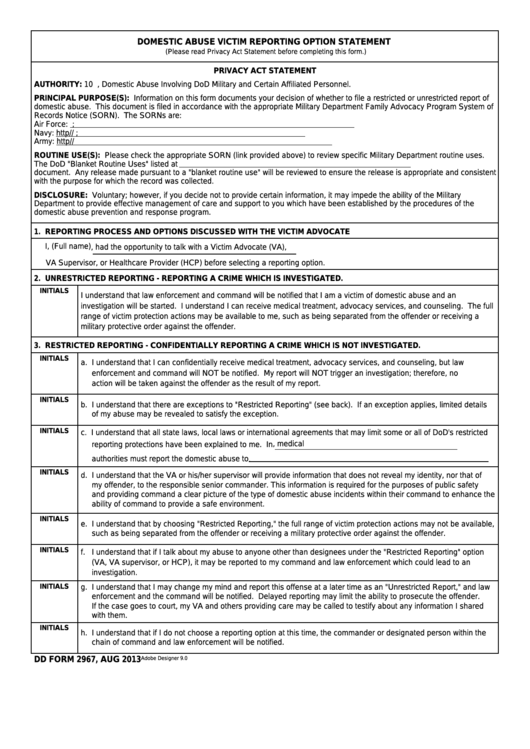 Complete Dd Form 2967 - Domestic Abuse Victim Reporting Option Statement with your personal data - all interactive fields are highlighted in places where you should type, access drop-down lists or select multiple-choice options. AUTHORITY: 10 U.S.C. 136 and DoD Instruction 6400.06, Domestic Abuse Involving DoD Military and Certain Affiliated Personnel. ROUTINE USE(S): Please check the appropriate SORN (link provided above) to review specific Military Department routine uses. with the purpose for which the record was collected. domestic abuse prevention and response program. VA Supervisor, or Healthcare Provider (HCP) before selecting a reporting option. 2. UNRESTRICTED REPORTING - REPORTING A CRIME WHICH IS INVESTIGATED. military protective order against the offender. 3. RESTRICTED REPORTING - CONFIDENTIALLY REPORTING A CRIME WHICH IS NOT INVESTIGATED. action will be taken against the offender as the result of my report. of my abuse may be revealed to satisfy the exception. ability of command to provide a safe environment. such as being separated from the offender or receiving a military protective order against the offender. enforcement and the command will be notified. Delayed reporting may limit the ability to prosecute the offender. chain of command and law enforcement will be notified.